120 minute fire rating, £2,000 insurance rating. Handy lockable drawer supplied with 2 keys. Door includes five locking bolts. Construction Double walled steel plate body and door filled with concrete. Extra Additional 60 minutes fire protection for DVDs, USB Sticks and External Hard Disk. Phoenix	The Phoenix FireFox SS1622k is a fireproof security safe which is secured by a high security double bitted key lock. 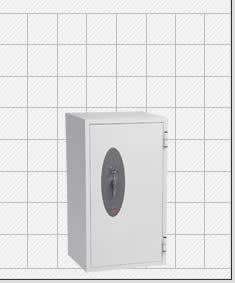 This large Capacity fireproof safe is tested and certified to provide 120 minutes fire protection for paper to the NT Fire 017 - 120P standard. The Phoenix FireFox is also EN14450 S1 rated and includes an approved insurance rating of £2,000 cash or £20,000 valuables. You can also view 2 other sizes available in this range.